Discover cheap holiday packages to Bali from Auckland, Wellington, Christchurch and Queenstown. Located only 11 hours away from New Zealand, the tropical paradise of Bali is the ultimate island getaway for travellers on any budget. Take the stress out of planning your trip by booking a flight and hotel package deal. Webjet's holiday packages help you save money by combining cheap flights to Bali with hotel stays to give you exclusive holiday package deals. Search now and find the best deals for your trip to Bali from New Zealand. Before the best selling book Eat, Pray, Love; Bali was a lesser-known island in Indonesia. Its affordable luxury, beautiful natural scenery and delicious food have made it one of the most popular holiday destinations for New Zealanders. The buying power of the New Zealand dollar is one of the main reasons thousands of people flock here each year. It's not every day you can rent out a private villa without breaking the bank and grab a meal with drinks for less than NZD 10. Holiday resorts in Bali are also perfect for bargain hunters or luxury seekers. You’ll be able to find options right on the beach that will suit any budget. 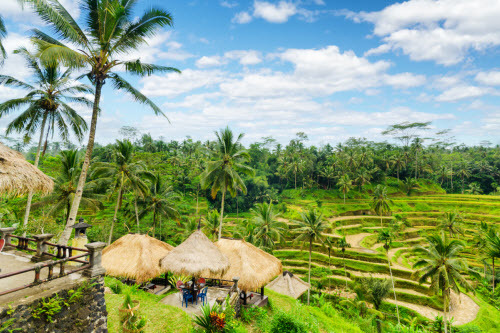 The short journey time is another factor in Bali's favour. Emirates fly direct from Auckland to Bali but other options mean that, at most it takes 15 hours to fly from Auckland to Bali with a stopover in Australia. So if you plan your flight time right, you can leave New Zealand in the morning and be checking into your hotel in Bali by the evening. With over 10,000 temples on the island, Bali's spirituality is a major drawcard. From cooking classes to Balinese dances and even visiting traditional healers, you won't need to go far to immerse yourself in the island's unique culture. 1. Money: The Indonesian Rupiah is the main currency used in Bali. You'll get a better rate of exchange by withdrawing money once in the country rather than converting your New Zealand dollars at the airport. 2. Electricity: Bali uses the 220 volts European style 2-prong rounded pins. You'll need to bring an adapter if you want to charge your laptop or use any other electrical appliances from New Zealand. 3. Entry Requirements: New Zealanders with a passport valid for at least six months can get a 30-day visa on arrival in Bali. 4. Language: Bahasa Indonesia is the island's official language. However, English is widely spoken in Bali especially in popular tourist areas such as Ubud and Canggu. 5. Weather: The best time to travel from New Zealand to Bali is during the dry season from May to September. But if you don't mind the occasional afternoon downpour, you'll pick up better deals in the wet season that lasts from October to April. 6. Getting Around: In Bali, cars drive on the left-hand side of the road. If you want to hire a car or motorbike, you'll need an international driver's license. 7. Drinking Water: It's not safe to drink the tap water in Bali. Stick to bottled water or fill up your water bottle at designated stations in hotels and restaurants. 8. Temples: All visitors are required to wear a sarong at temples. If you don't have one, you can rent one from the keepers for IDR 10,000. Entrance is usually free, but you will be asked to make a small donation to help with the upkeep of the holy sites.